This entry was posted on October 12, 2015 by Jessica Anderson. Inspired by the recent New York fashion week, here's my biannual update of award trends. Just like fashion and home décor, trophies and awards offer fresh styles for the seasonal change, with the top award trends for Fall 2015 listed below. Engrave office winner's names onto this attractive perpetual trophy. Customers are asking for a new option in corporate recognition, which is ongoing Perpetual Trophies. Perpetual plaques continue to be popular, but for something different that can be passed around the office, a Perpetual Trophy makes a popular choice. Due to demand, we are continuing to develop contemporary styles of perpetual trophies for business, including more formal achievement trophies along with whimsical joke trophies. Chili trophies continue to be some of our hottest sellers this fall. Whether at the office or with family and friends, everyone loves a cook off and fall is a great time to show off culinary skills with hot and spicy chili. Get my top 8 tips for planning a chili cookoff here. A great way to fire up the competition at your next cook off is to award both the participants and winners. Chili trophies, gifts, medals and ribbons make unique, fun and affordable prizes; browse our large selection in our Chili Cookoff Category now! 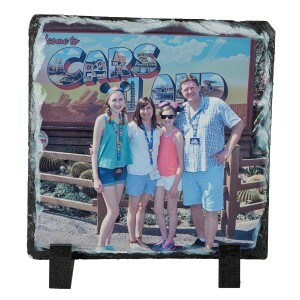 This one of a kind artwork is a stone tile with a color photo (our family in Disneyland this June). 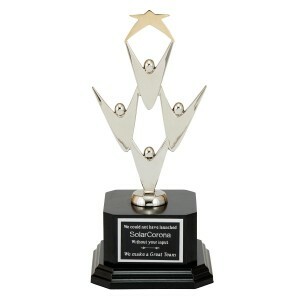 Color Imprinted Awards are a huge trend - bright colors and customization make eye-catching awards! Using high-tech sublimation, ink is permanently bonded to the surface of the item. Photo panels, plaques, name badges, clipboards, acrylic awards, and bag tags are just a few of the many items that can be color imprinted. This trend features vibrant colors for a completely personalized look. Just like last year, bamboo remains one of the hottest wood in awards. Sustainable and renewable, bamboo's hard surface and pretty honey color make the perfect material for plaques, cutting boards, and even travel mugs! Beautiful when laser engraved, bamboo awards and gifts are easily personalized. Great to look at and good for the earth, these awards are a win-win! Check out all of our eco-friendly bamboo items in our Environmentally Friendly Awards Category. Mix things up with your awards this fall by picking a trendy piece. Just like with your wardrobe, adding just one new item can really jazz up your awards program!